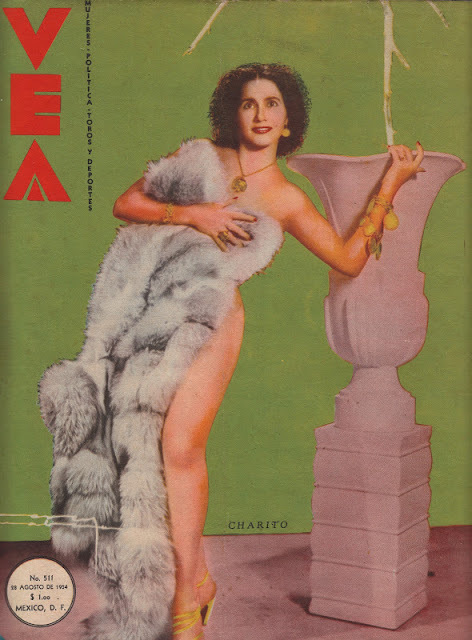 VEA was a weekly pulp periodical which ran for years throughout the 50's & 60's but was apparently often in trouble with the law, largely due to censorship issues of the times. The magazine was a menudo of news, bullfighting reports, pulp fiction (with illustrations that look like Charles Burns on peyote) and breasts. There is really nothing to compare the magazine to in the states then or now, but it was similar to the Folies De Paris et de Holllywood magazine from France which was running the same time. Some of the Harrison mags like Whisper maybe. Large format, large on style and striking today. Images and text knicked from here.